Today, almost all services we use have some sort of API. 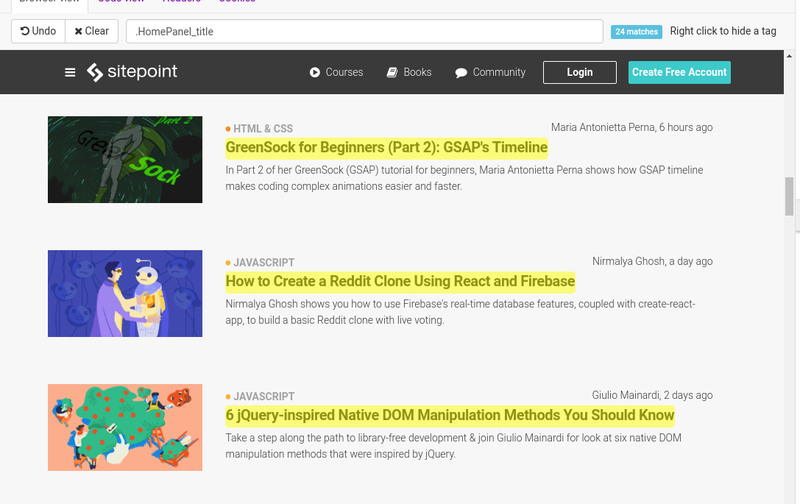 Some web applications are even built from API points alone, being passed to some kind of front-end view. If you’re a consumer of a service that provides an API, you’ll sometimes need more features or find limits to what the API can offer. In this article, we’ll cover a service that’s useful both for API consumers and creators. I always go with the saying that, if there’s a web interface, you can build your own API over it. WrapAPI tries to make this process easier. If you’re familiar with the process of web scraping/crawling (or extracting data from websites), you’ll see the magic of WrapAPI. WrapAPI offers a service that allows you to easily extract information from websites and create APIs from the data. It provides an easy, interactive way of selecting what information you want to get. With just a few clicks, you can have your API online. To follow along with this tutorial, I recommend you head over to wrapapi.com and create an account. On the WrapAPI site, you’ll see that you can start to build your project right away — although, unless you create an account, your work won’t be saved. Once you’ve signed up, click the Try building an API button. Below the URL bar there are four buttons that give you different information regarding the site you’re viewing. Browser view displays the site as you would visit it from your browser. Code view displays the source code of the site. Headers shows the response you get from the server. This is useful if you want to see what response you get from the server: it gives you information like the HTTP status codes (200, 404, 400 etc. ), content types, web servers and so on. You can also view the request’s Cookies directly from the builder. 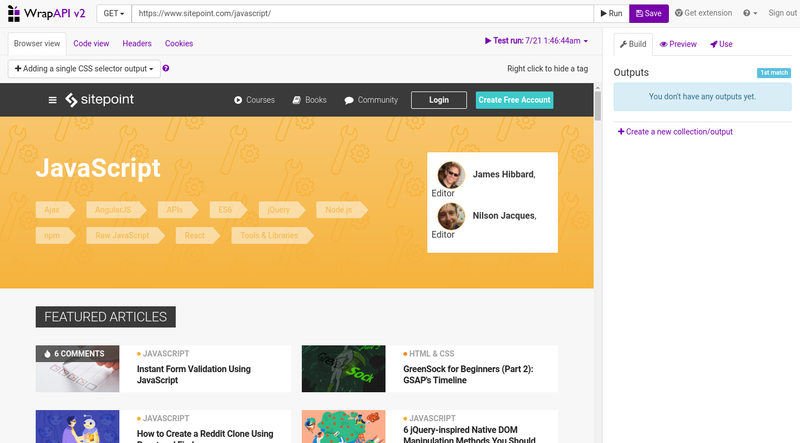 By now you should be able to see SitePoint inside the Browser View frame. Besides CSS selectors, WrapAPI supports regular expressions, JSON selectors, headers, cookies, form outputs, and a bunch more options. You can use them all together and extract exactly what you’re aiming for. In this example, we’ll only use CSS selectors. In the right part of the interface, you’ll see three tabs. Let’s take a look at the current Build tab. Outputs will show us the selectors (in our case CSS selectors), and you’ll get more details on what you would like to select. We’re interested only in extracting the title, which is text. There are more options on cleaning the result output, but we won’t get into these details. If you’d like to create another selector, to select description, author, date, etc., just click the Create a new collection/output. Naming your selectors is also important, as this will make it easier if you use multiple selectors in the site. By clicking the pencil icon, you can edit your selectors. The Preview tab will show a representation of our data in JSON, and you probably get the idea of what the API will look like. If you’re happy with the results, you can click the Save button to save a version of the API. You’ll need to enter the repository and the endpoint name of the API. It helps you manage and organize your APIs. That will also be part of your API’s name in the end. After entering the information, you’ll return to the builder. Our API is saved, but now we need to test and publish it. Name your selectors correctly, as they’ll be part of the JSON output. Open the Chrome DevTools, and navigate to WrapAPI tab on the very right tab. 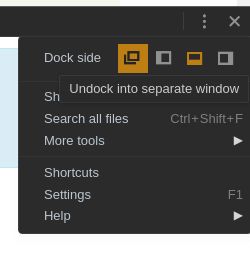 Undock it into a separate window. Log in with your WrapAPI credentials. Whenever you’re ready, press the Start capturing requests button. Refresh the main tab you where using. Select the request you want to make into an API (using GET). 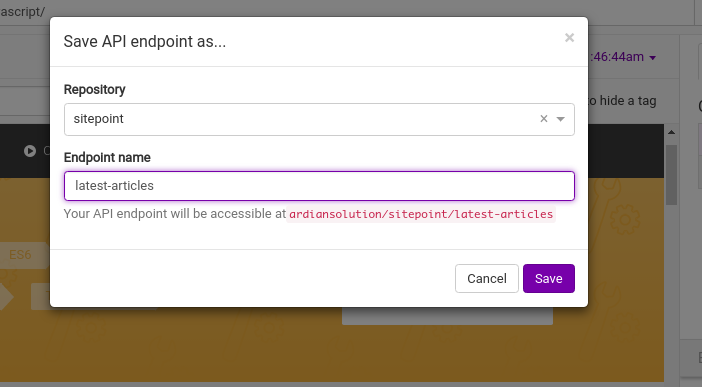 Click on Save to API endpoint and save it into a repository. You’ll be redirected to the builder, in order to extract the data. The benefit of using this method is that you can bypass login pages and use your already assigned cookies. Before publishing our API, we have to freeze it. Selecting a release number such as 0.0.1 works fine. Note that any changes you make to the API, you’ll have to freeze it as a new version, by also increasing the version number. Provide a simple description of what your API is about, or if it’s an update, what changes it contains. Finally, press Publish. The last step before publishing is to generate a key. Click Generate an API key. All green? that must mean we’ve successfully completed the steps required to publish our API, and that’s almost right. The last step is to click the Publish button at the top, after the URL bar. You can already see the different programming languages you can use to test the API. 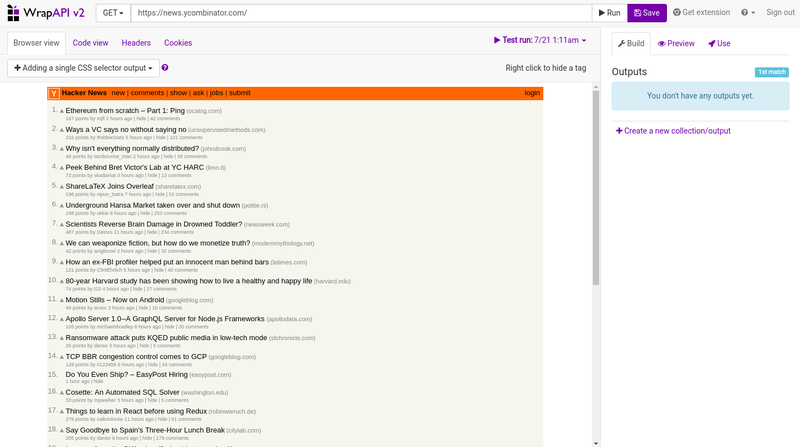 I’ll use my browser with an extension for presenting JSON in a better way. 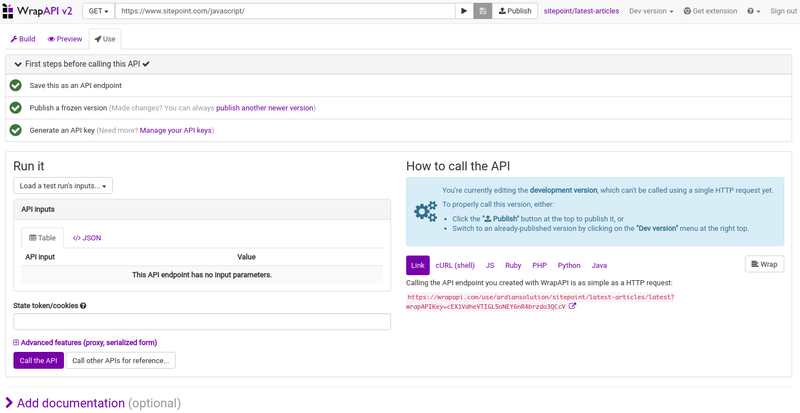 Within a minute, we were able to create an API from a simple web interface. There are some things you should consider. Scraping/Extracting data from websites can sometimes have legal implications regarding the content found on the website. If you happen to use a website as a service for your API, consider asking for permission to use that content, especially when distributing it as an API. WrapAPI provides some really great and easy-to-use features, but they don’t come without a price. The free and community accounts come without any cost, but you can only create public APIs, and there’s a limit of 30,000 API calls per month. There are a couple of pricing plans. 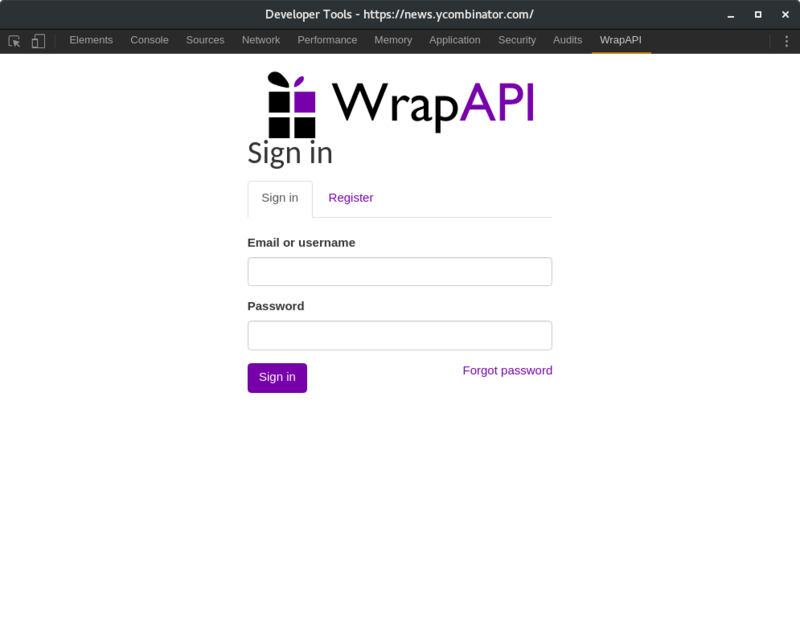 You can always create your own APIs and scrapers, but if you lack the skills, or don’t have time, then maybe WrapAPI is something you might want to try.